My husband loves spicy meals and I do most of the time. 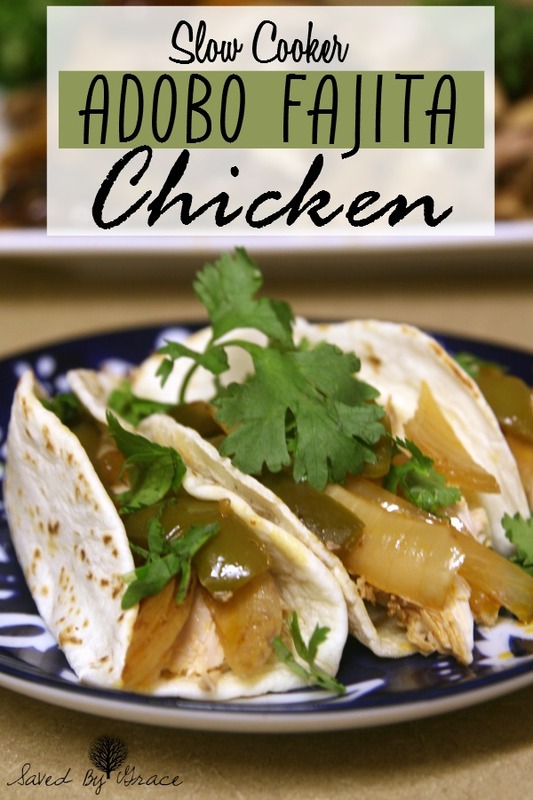 What’s silly is I don’t like the texture of onions and peppers and this Adobo Fajita Chicken recipe calls for both yet I loved it. 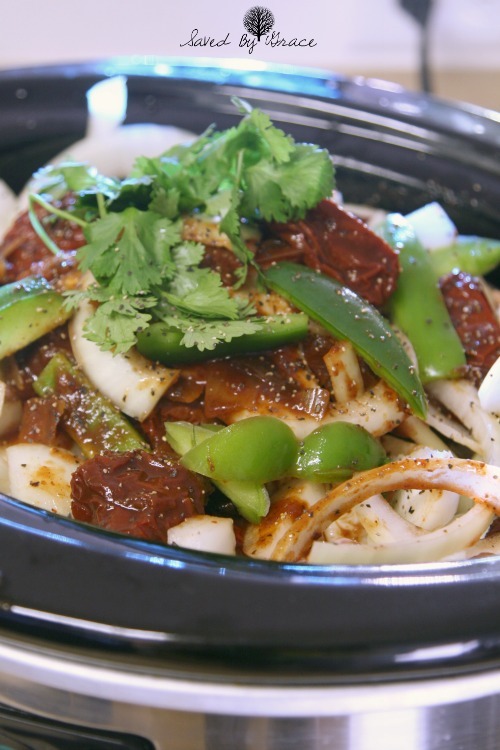 This recipe is for a slow cooker like a crock-pot and we let it cook all day. It left the house smelling absolutely wonderful like a west-Mex restaurant or a taco truck. The chicken was fall off the bone delicious. I couldn’t believe how good and tender it was considering this was a whole chicken I had forgotten about in the back of my freezer for like 6 months. 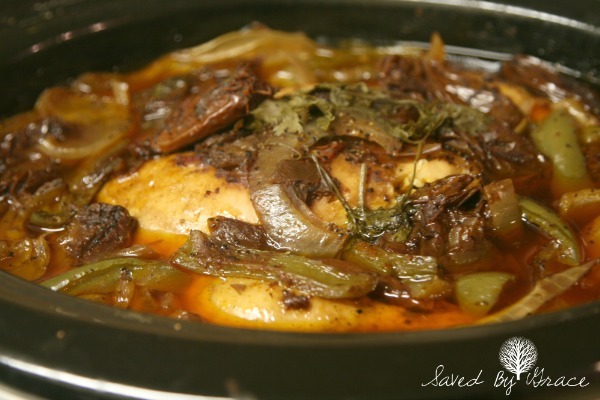 This recipe could work in a larger instant pot although I am not sure of the calculations or time with that as I made this in my slow cooker before I got an Instant Pot. 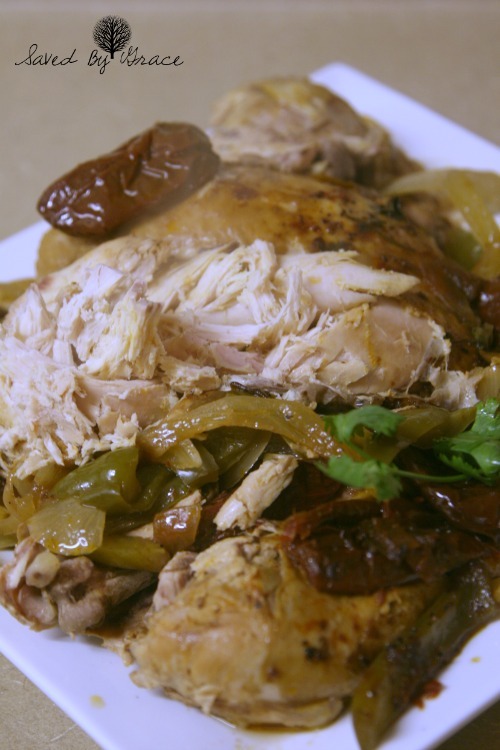 I suggest looking for a recipe on cooking a whole chicken in an instant pot and see if you can get them there. 1. Cut your bell pepper and onion into strips. They don’t have to be perfect as they will cook down. Dice your jalapenos and gut them of the seeds. Set aside. 2. Stuff your chicken with 3/4 of the onions and bell pepper. If you can’t fit that much, stuff as much as you can. 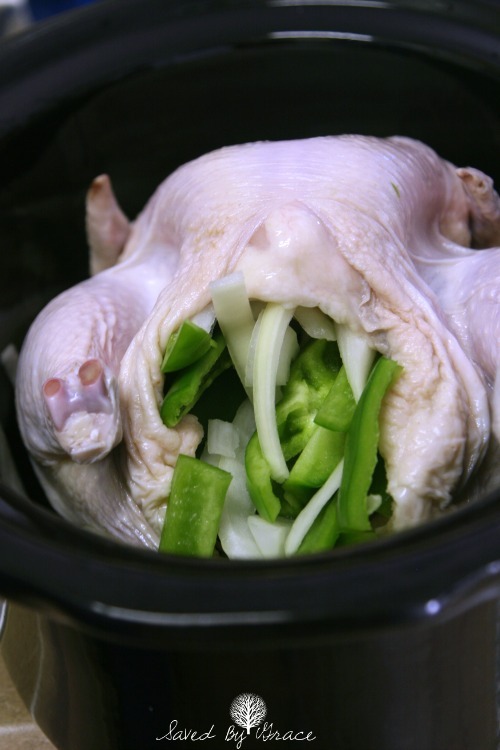 Place your chicken into your crock-pot. 3. Remove your peppers from their can and add the sauce and peppers over the top and sides. Top with remaining onions and bell peppers. 4. Throw in the cilantro (1/2 a bunch into the pot) and add in your chicken stock. If 2 cups broth is too much, reduce down. Sprinkle with salt and pepper to taste. 5. Cook on HIGH for 2 Hours. Turn down to LOW for an additional 6 hours. 6. When chicken is done, using a fork and tongs (or turkey lifters), remove the chicken and place on a plate to shred, making sure to remove all bones. 7. 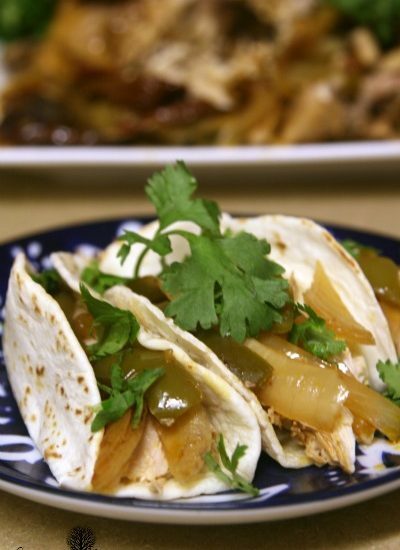 Serve in warm tortillas with peppers and onions from pot and fresh cilantro. Cut your bell pepper and onion into strips. They don't have to be perfect as they will cook down. Dice your jalapenos and gut them of the seeds. Set aside. Stuff your chicken with ¾ of the onions and bell pepper. If you can't fit that much, stuff as much as you can. 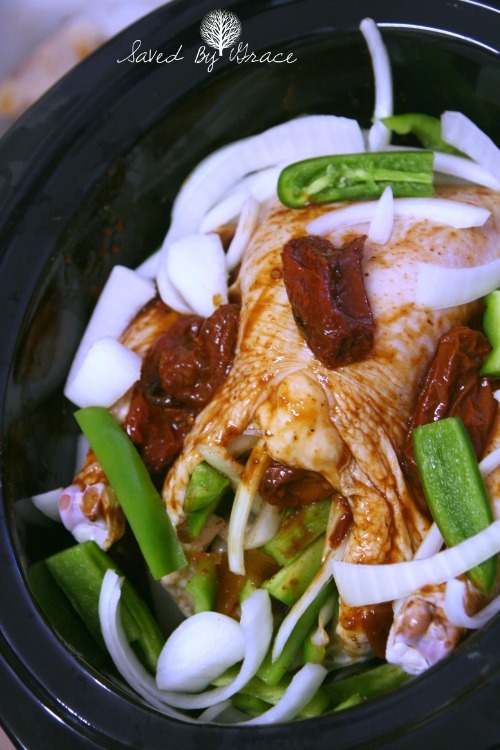 Place your chicken into your crockpot. Remove your peppers from thier can and add the sauce and peppers over the top and sides. Top with remaining onions and bell peppers. Throw in the cilantro (1/2 a bunch into the pot) and add in your chicken stock. If 2 cups broth is too much, reduce down. Cook on HIGH for 2 Hours. Turn down to LOW for an additional 6 hours. When chicken is done, using a fork and tongs (or turkey lifters), remove the chicken and place on a plate to shred, making sure to remove all bones. 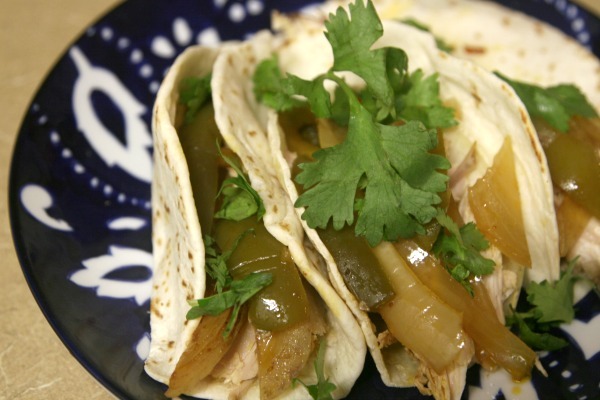 Serve in warm tortillas with peppers and onions from pot and fresh cilantro.